The aromatic herbs make all the difference in the world when it comes to not only the flavors and but also for the healing our overall health. 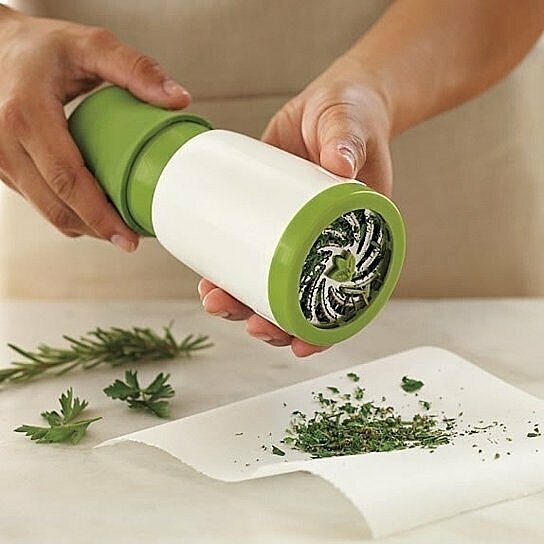 Having THE HEALING HERBS MILL handy today is making a smart and healthy choice for yourself. Made from food grade plastic and Stainless steel blades. Hundreds of tiny blades that cross cut the herbs. For dry or green herbs. Dish Washer safe upper rack. Grind Ginger and Mint into Green tea for flavor and digestion. Grind the Rosemary and Thyme to add woody spice to your grilled dishes. Grind some Oregano and Cumin to sauces and soups to sooth cough. Grind Basil to sooth stomach. Grind Garlic to improve cholesterol levels and reduce blood pressure. Grind Capers and Olives to add to salads for delicious flavor. Grind Parsley and Cilantro to flavor and decorate gravy. Chop leafy herbs and dry them to store for later use.